Apart from prescribed medications, you may want to manage anxiety with natural remedies. So, what are the best natural herbal supplements for anxiety? And what scientific studies have got to say about them. It’s common to have worries in your day-to-day life. But when worrying escalates to a state where it disrupts your decision making and paralyzes your thoughts, it is likely that you’ve developed some form of anxiety disorders. Anxiety may seem like mere imaginations for those who never when through the ordeal. But anxiety is real, just as the natural herbal supplements that are claimed to help with anxiety. Hyperventilation – In chronic cases, you’ll feel shortness of breath or hyperventilation and may mistake this symptom for cardiac arrest. However, hyperventilation during a panic attack creates an excessive amount of oxygen in the body and could aggravate the attack. Excessive worrying – Anxiety can reduce an optimist person to one who is constantly worrying throughout the day. Worrying become an endless cycle that feeds on its own negative energy. Insomnia – Incessant worrying drains your mind of energy, but also prevents you from falling asleep easily. Insomnia is often a common symptom of anxiety. Lacking sleep, you’ll lack the mental energy needed to ward off negative thoughts. Loss Of Focus – In short, your mind is in a mess when anxiety strikes. You’ll find it hard to focus on anything, even for a couple of minutes. Dealing with anxiety is a formidable challenge. At times, you’ll feel like there is no end to the worries. At its worse, anxiety can disrupt your work and affects you financially. Herbal supplements are a popular remedy for alleviating anxiety. They are derived from plants and herbs through an extraction process that preserves the healing properties. Most herbal supplements are available in capsule, tablet, tincture, liquid extract and powder form. Some supplements are derived from a single active ingredient while others may contain a few natural herbs. Can Natural Herbal Supplements Treat Anxiety? Anxiety doesn’t happen overnight. It takes months of stress, worrying or rehashing traumatic experience to aggravate the symptoms, and possibly affecting the brain structure itself. It will be a far-fetched claim to suggest that herbal supplements are the ultimate remedy for anxiety. The truth is, treating remedy is an ongoing process that involves multiple aspects of your life. Herbal supplements though, do help along the way. Most of the herbs are deeply rooted in civilizations, and our ancestors have been using them to treat anxiety and other illnesses. Medical science has a relatively shorter history and with herbal supplements not regulated by the FDA, some herbs may yet to be proven effective by research. With that said, you shouldn’t assume that a particular supplement will be effective just because it is proven so. Herbal supplements are not regulated as prescription medicines. There are no controls on the manufacturing process, and subsequently, the quality of the supplement itself. Do your due diligence before getting a herbal supplement. If you’re taking herbal supplements, you need to understand that they are not a replacement for any prescription drugs or therapies suggested by your doctor. Instead, do talk to your doctor before taking any herbal supplements. Some herbal supplements may interact with existing drugs and produce side effects. Talk to your doctor before introducing any herbal supplements for children. Certain herbs like chamomile can induce drowsiness. You’ll want to ensure you’re not driving or operating heavy machinery immediately after taking the supplement. You’ll want to make the right choice when choosing herbal supplements. You wouldn’t want to waste paying for products that have no effect on reducing your anxiety. Worse, some sub-par products may contain ingredients that could be harmful to health. Take note of these criteria when choosing a herbal supplement product. Type of Herbs – Each type of herbs have unique properties. Often, they do more than calming your mind from worries. You’ll want to consider other healing benefits offered by the herb. Agricultural Practice – Avoid herbal supplements that do not clearly state the origin of the plants. You’ll want to get supplements that are certified organic, and tested for harmful chemicals. Manufacturing Process – What happens at the manufacturing facility can affect the final quality of the product. Look for manufacturers that produce the supplements in a GMP-verified facility or similar strict quality control practices. Physical Form – Capsules and tablets are common forms of supplements. It is convenient to take and great for individuals who are sensitive to the taste of the herbs. Liquid extracts typically offer a greater absorption rate while raw powder herbs can be mixed into your favorite smoothie. Sometimes, picking a herbal supplement product and hoping for it to help with anxiety can be a tall order. There are literally hundreds of herbal supplements offered by different manufacturers. I’ve compiled some of the top picks to make your buying decision easier. 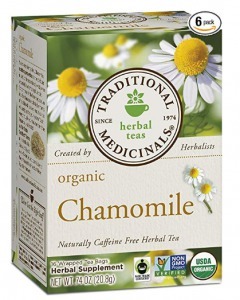 Chamomile is a herb that belongs to the Asteraceae/Compositae family. Uses of chamomile have been traced back to ancient civilizations where it was used for treating various ailments. There are to major variants of chamomile, German Chamomile, and Roman Chamomile that are often used in supplements for anxiety. The healing properties of chamomile originate from the flavonoids, that is believed to produce a calming effect on the mind. A clinical study that involves 180 patients with Generalized Anxiety Disorder who were prescribed with chamomile capsules for 8 weeks shows a reduction in reported symptoms. Rather than capsules, Chamomile is commonly taken as a herbal tea. Traditional Medicinals is known to produce high-quality organic chamomile tea bags. You can brew a cup of chamomile tea by steeping a tea bag into a cup of hot water for 5 minutes. The bittersweet flora taste of chamomile will soon calm your mind from anxious thoughts. As the tea bag only contains the finest flowers and no traces of leaves and stems, you’ll be getting a cup of chamomile tea that is superior to other regular brands. Some customers received damaged products. Herbal supplements usually have rich histories that transcend generations. But Ginkgo Biloba goes beyond human history as the tree is the only species that may have existed since the ages of dinosaurs. The leaves from the oldest tree in the world are known for its medicinal properties. Ginkgo Biloba has been widely used in traditional Chinese medicines. In modern medicines, Ginkgo Biloba is linked to treating dementia and a study conducted by German researchers has also shown a promising result for its use in treating anxiety. 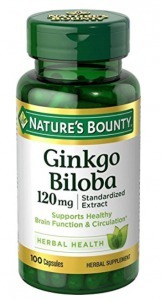 This Nature’s Bounty Ginkgo Biloba extract may offer you the relief from stress and anxiety. It is made from Ginkgo leaves sourced from multiple countries around the world. The Ginkgo capsules contain no artificial fillers and are non-GMO. A single capsule contains 120 mg of Gingko extract and that’s all you need to take daily to boost your mental health. You’ll also experience an improvement in memory and focus as the compounds in the Ginkgo extract enhance your cognitive function. Kava has caused a growing excitement as a remedy for anxiety in modern days. But this extract that is made from the roots of Piper methysticum has been used by the people of Fiji and Tonga islands for hundreds of years. This unique herbal remedy contains kavapyrones which induce a relaxing sensation without causing drowsiness. It has attracted the attention of researchers and one study in 2015 that involves 210 participants shows positive results of the usage of kava in treating Generalized Anxiety Disorder. 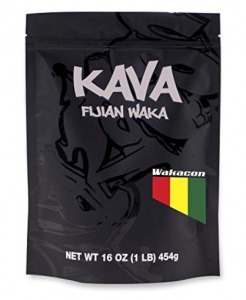 One of the finest kava supplements is sold by Wakacon and is available in powder form. Making a kava drink is relatively simple. It involves pouring the kava powder into a strainer bag and immerse it into a bowl of warm water and squeeze it for 10 minutes. As you take a sip of the kava elixir, you’ll be greeted by a strong taste that may cause numbness to your tongue. This is an indication of high quality and potent kava powder. You’ll also notice the sedative effect almost immediately after you take the first cup of kava beverage..
Made of potent lateral roots. Some individuals dislike the taste. Lavender is arguably one of the most popular herbs that are used for treating anxiety and other mental distress symptoms. Its history can be traced back to 2,500 years ago where it was used by the ancient Greeks and Romans. Its pleasant floral scent and beautiful visual appearance have made lavender a common remedy in many countries. While lavender supplements are less popular than its use in aromatherapy, taking lavender extract orally is equally effective for anxiety. In a study published in 2010, Silexan, a capsule-based lavender oil was prescribed to 221 adults with the anxiety disorder. The result concludes that lavender is effective in alleviating anxiety symptoms. If you prefer taking lavender supplements instead of aromatherapy, Nature’s Way Calm Aid lavender soft gels is a great option. It contains Silexan, the same lavender oil that is used in the clinical study. The soft gels are gluten-free and contain no artificial fillers. You’ll need to take a single soft gel daily to reduce anxiety related symptoms. The soft gels are easy to swallow and do not cause drowsiness. 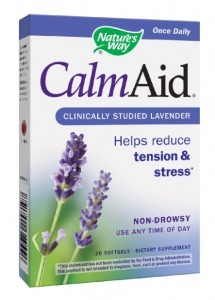 If you’re suffering from insomnia, taking CalmAid also helps in getting you the much-needed sleep easily. High-quality lavender oils used in clinical studies. Lemon balm is usually mistaken from mint, as they are almost similar in physical appearance and scent. In fact, lemon balm or Melissa officinalis, originates from the same family as mint. Today, lemon balm is grown all over the world. While lemon balm has been used for aromatic purposes, its primary value is in its medicinal properties. Lemon balm is known for its healing properties in various aspect of wellness, including alleviating anxiety. Scientific studies have shown that lemon balm is an effective agent in promoting a positive mood. 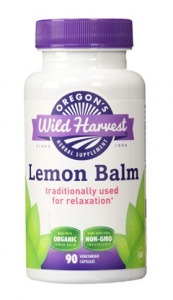 There’s no need to go plucking lemon balm in the garden when you get this lemon balm capsules by Oregon’s Wild Harvest. With more than 2 decades of industry experience, Oregon’s Wild Harvest is committed to delivering high-quality supplements made from organic ingredients. The lemon balm capsules are vegetarian-friendly and made of non-GMO ingredients. It is recommended that you take 3 capsules daily if you’re experiencing severe anxiety. The lemon-like scent and the natural compound will gradually calm your mind down. Made of organic lemon balm leaves. Passion flowers are truly wonderful creation of nature, both in its physical appearance and medicinal properties. The flower is a beauty to behold with colorful texture circling its core. But what’s important is the fact that passion flower has been used by native Americans to treat various conditions. There are over 500 different species of passion flower and one particular variant, Passiflora incarnata, is known to treat anxiety and insomnia. A study conducted by the Tehran University of Medical Sciences shows a remarkable reduction in anxiety when 36 out-patients are prescribed with passion flower extracts for 4 weeks. 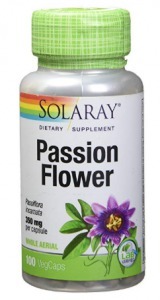 One of the best passion flower supplements to relieve anxiety is produced by Solaray. Each capsule contains potent extracts of passion flower that works effectively for anxiety. It is suggested that you take 2 capsules daily during a meal or with a glass of water to benefit from its therapeutic effect. You’ll experience a soothing state of mind within an hour of taking the capsules. This speaks volume of the supplement’s purity which has been verified by a laboratory. Taking the passion flower capsules also help with insomnia. Works well for anxiety and insomnia. The valerian plant, valeriana officinalis is identified by its miniature flowers and distinct smell that attracts butterflies. Its root contains immense therapeutic properties and has been used to treat anxiety related symptoms from thousands of years ago. Valerian root works by increasing the level of GABA, a neurotransmitter that is responsible for uplifting our emotion. There are limited studies conducted on valerian root to suggest its effectiveness for anxiety. However, a study conducted by researchers in California suggested that valerian root may improve sleep quality. 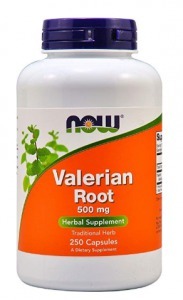 With more than 50 years of experience in nutritional health, NOW Foods is a reliable manufacturer to get your valerian root supplement. The valerian capsules are produced in a state-of-the-art manufacturing facility and thoroughly tested in laboratories to ensure they are pure from harmful components. If anxiety is robbing you of precious sleep, you can take two valerian capsules prior to bedtime. Not only do you ease off to sleep easily, but you’ll also enjoy a night of uninterrupted sleep and wake up refreshed in the morning. Just avoid taking the capsules if you’re driving as it may cause drowsiness. Effective in relaxing the mind. Great for people with insomnia. Did not work for some people. Ashwagandha is no stranger to Ayurvedic practitioners. It is one of the most powerful herbs used in India for more than 5,000 years. In modern science, ashwagandha is categorized as an adaptogen, which means it is able to help the body to cope with stressors. It helps the body to reduce cortisol, a stress-related hormone and increases GABA that creates positive emotion. Medical researchers in India have documented a study that proves the potency of Ashwagandha in reducing stress and anxiety in 64 participants. You can tap into the power of Ayurvedic medicine with this ashwagandha root powder NutraHerbals. It is sourced from organically grown Ashwagandha herb and contains no additive or chemicals. 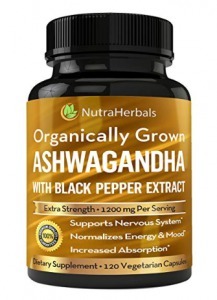 The Ashwagandha extract is mixed with black pepper powder to enhance the absorption rate. A single serving of two capsules contains 1,200 mg of Ashwagandha powder. Taking two capsules daily helps to ease your mind of stress and anxiety. You’ll find yourself returning to your normal cheerful self after a few days of taking the supplement. Made of organic potent ashwagandha root. Enhanced absorption rate with black pepper powder. Help an anxious mind to relax. Rhodiola Rosea bears the nickname of ‘Golden root’ and ‘artic root’. It is a form of adaptogenic herb that helps to body to adjust itself to stress and anxiety. It is a commonly used herb in traditional Chinese medicine. Besides that, the Russian have also been using Rhodiola for treating anxiety for hundreds of years. The primary benefits of Rhodiola are reflected in its ability to promote mental wellness. A study conducted by the University of California in 2006 involves prescribing 10 participants with Generalized Anxiety Disorder. After being prescribed with Rhodiola extract for ten weeks, the participants show a significant reduction in anxiety symptoms. 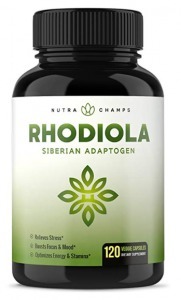 The Nutra Champs Rhodiola supplement is made from the finest Rhodiola herbs sourced from the mountain of Siberia. The plants are grown on the mountain for at least four years before they are harvested. They were produced in a GMP-certified facility. Each of the capsules is vegan and non-GMO. Taking 2 capsules on a daily basis will help to boost your mental health and ward off anxiety. The highly effective adaptogen helps to boost your mental energy and enable you to stay focused through the day. Harvested from the mountain of Siberia. Helps to reduce anxiety symptoms. May cause side effects for some individuals. 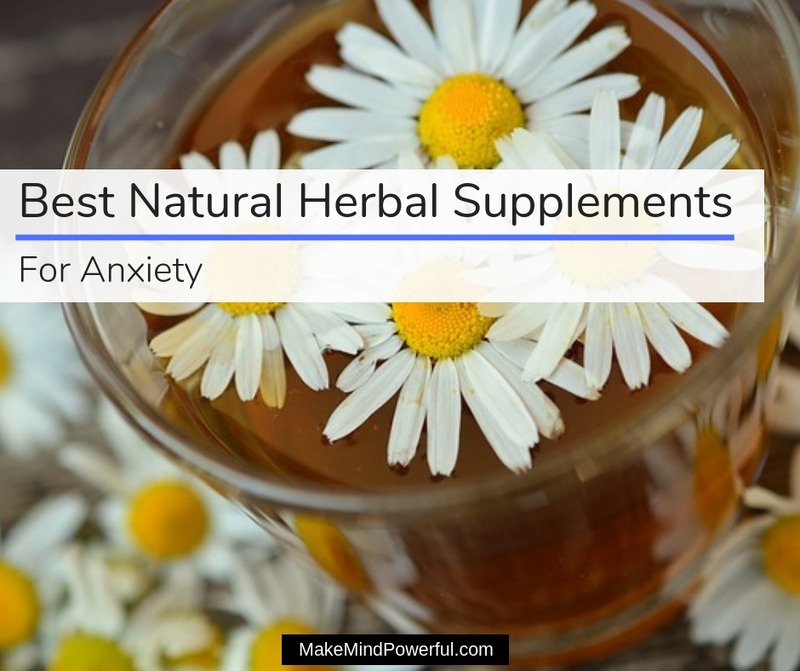 There are occasions where you’ll want a herbal supplement that is made from the best anxiety-relieving ingredients. 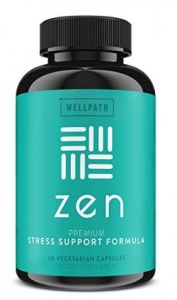 This Zen herbal supplement is made of lemon balm, passion flower, Ashwagandha, Rhodiola, bacopa, hawthorn leaf, Hops extract, L-Theanine, Bioperine, Magnesium and enhanced with a range of Vitamin B.
Zen is produced by Wellpath, a reputable nutritional supplement manufacturer that is endorsed by major publications. The herbal capsules are made in a GMP-certified facility and are GMO-free. You’ll have a synergistic combination of natural ingredients for relieving anxiety. A dosage of two capsules is recommended on a daily basis for a noticeable effect. You can also take the supplement as a general routine to boost mental energy. You’ll enjoy the calming effect without the drowsiness associated with medications. 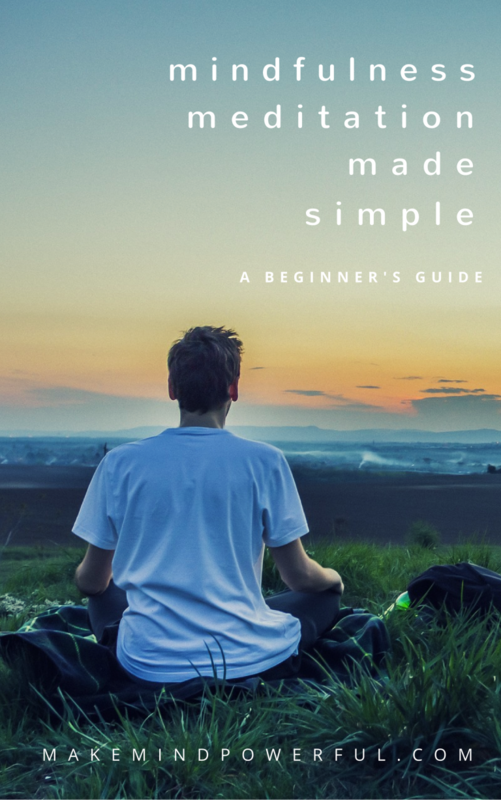 Made of mind-calming herbs and natural ingredients. Does any of these herbal supplements seem like the right choice to help with your anxiety? Which herbal remedy works for you? Share your thoughts in the comment below. Previous Post Best Caffeine-Free Herbal Tea For Sleep And Wellness In 2019 Next Post Is Hypnosis Real? What Does It Really Do For You?